American heavy metal band Godsmack formed in 1995 in Lawrence, Massachusetts. The band released its eponymous debut album in 1998. A commercial success, the album was certified gold by the RIAA the following year and by 2001 it was certified quadruple platinum. The band's popularity grew upon the release of their second album, Awake, which debuted at number five on the Billboard 200. The album launched the Grammy Award-nominated single “Vampires” and was certified double-platinum. From 2003 through 2010, Godsmack charted three consecutive number one albums on the Billboard Chart: Faceless, IV, and The Oracle. The band have also charted twenty top ten rock radio hits, including a record fifteen songs in the top five. 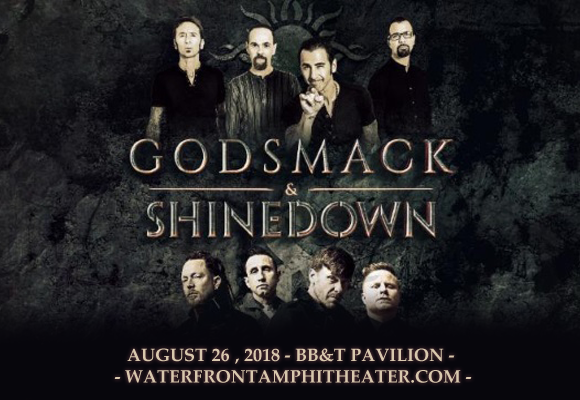 Godsmack's seventh studio album, When Legends Rise, is due for a 2018 release.